A deep blue dash streaks across the blazing hot desert, followed by a violent cloud of dust. It’s the Corvette ZR1 “Blue Devil,” racing towards our Skatter Tech office to deliver us another bright blue monster: the Kingston KHX2000C8D3T1K3/G6X, Hyper-X, DDR3, 6GB, 2000MHz, triple-channel memory kit, purported to be as wickedly fast as the ZR1. We’ll take it for a drive to find out. Kingston is a company that is ubiquitous in the memory world. Their innovative products from their market-leading 256GB flash drive to their line of fast SSDs give consumers both performance and value. Kingston sent us their KHX2000C8D3T1K3/6GX memory kit for testing, which consists of three 2GB memory sticks rated at DDR3 2000MHz speeds with timings of 8-8-8-24. The KHX2000C8D3T1K3/6GX memory kit looks daunting in its clear plastic casing. 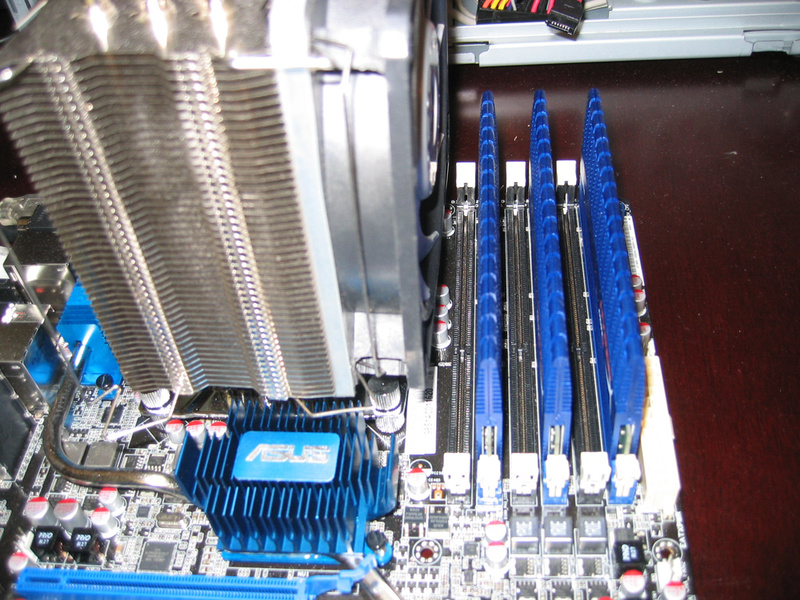 Right off the bat you’ll notice the tall and imposing Kingston-blue heatsinks attached to the memory sticks. Each memory stick stands 2.401in (61mm) tall with its heatsink, so make sure to check if these modules will fit if you have a large CPU cooler. Removing the RAM heatsinks isn’t advised, since the memory runs hot at a high 1.65V and 2000MHz. The user manual is tucked away beneath one of the ram sticks inside. Installing the Hyper-X kit was both simple and a bit tricky at the same time. Initially we just popped the RAM into its slots on the motherboard, booted into the BIOS, and selected the appropriate XMP setting to get up and running. 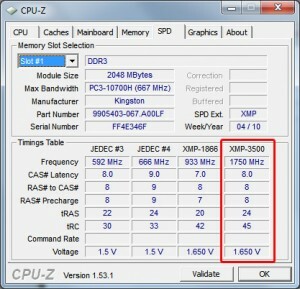 We later found when checking our BIOS settings that the XMP setting had set our i7’s uncore voltage to a dangerous 1.7V. This was very troubling, considering that Intel states 1.45V as the maximum safe voltage for the uncore. We searched the Internet and found that it isn’t uncommon for the i7 famiy of CPUs to need a high uncore voltage in order to run 2000MHz RAM. In the end, we were able to get the Hyper-X kit running stably at its full 2000MHz speed with a uncore voltage of 1.525V. In order to test the KHX2000C8D3T1K3/6GX memory kit we installed it into our ASUS P6T6 motherboard and fired up the computer. 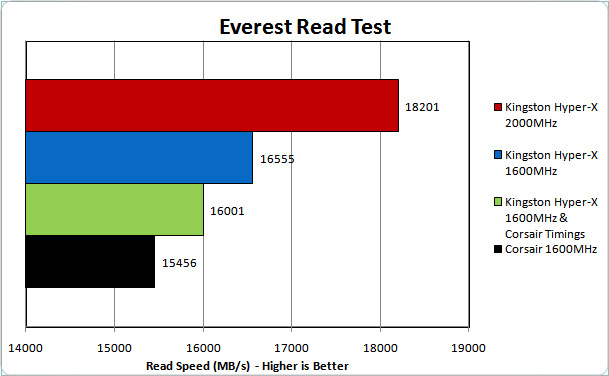 We stability tested the RAM with Memtest at DDR3-2000 speeds to check for any errors. Benchmarking consisted of running Lavalys’ Everest Ultimate Edition and SiS’ Sandra. 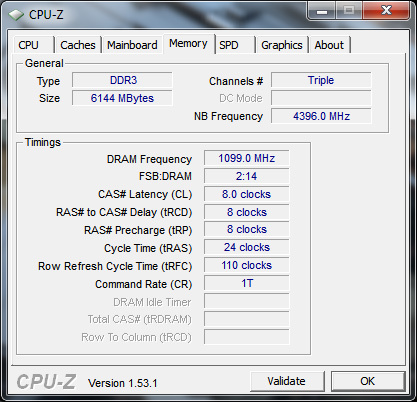 One quirk with DDR3-2000 RAM is that it tends to be fairly finicky. 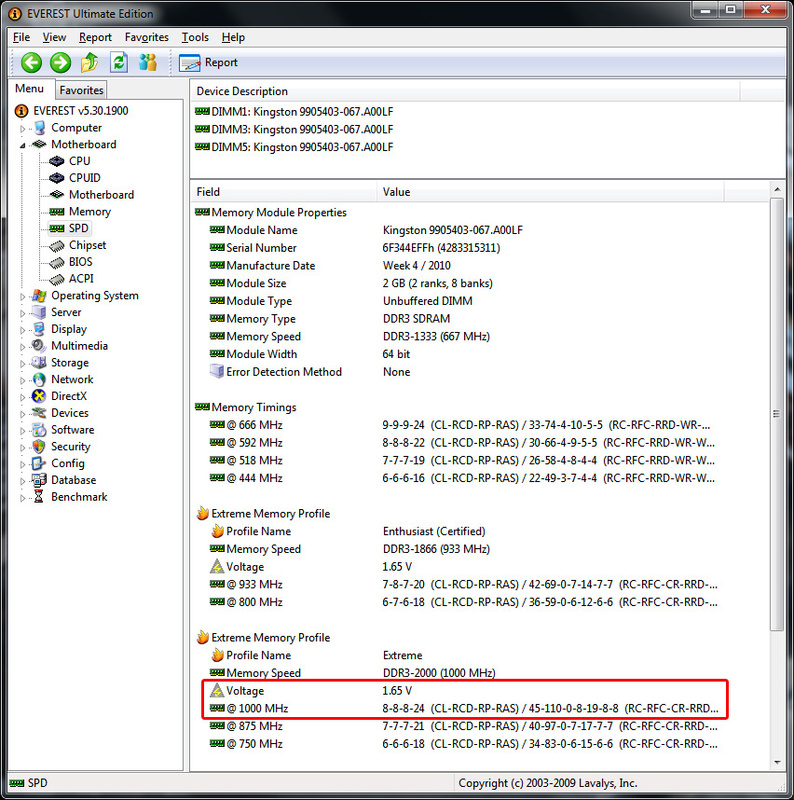 There are plenty of articles and forum posts online about people having problems running DDR3-2000 memory. Many of these anecdotes are people not being able to POST at DDR3-2000 speeds or having their RAM go bad after a short period of time. We wanted to make sure that our test sample of KHX2000C8D3T1K3/6GX wouldn’t falter or start acting up, so we ran it in the machine for a month to see if any issues would crop up. 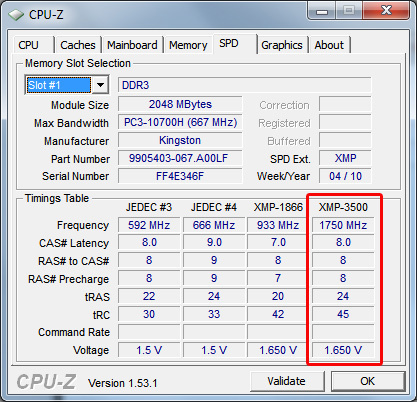 One issue when we first received the Hyper-X memory kit was that we saw a very interesting XMP setting in CPU-Z while looking at the SPD information. 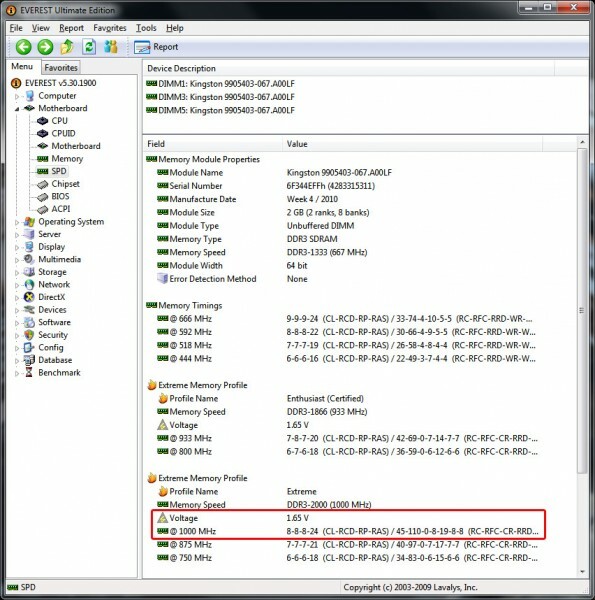 See that “XMP-3500” setting programmed into the memory? This puzzled us a great deal considering DDR3-2000 is supposed to be the fastest rated triple-channel memory kit; yet the SPD information says DDR3-3500 is programmed into this RAM. 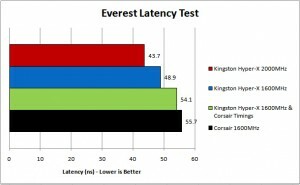 We ran Everest Ultimate Edition in order to validate our little finding. Everest put our fears to rest. 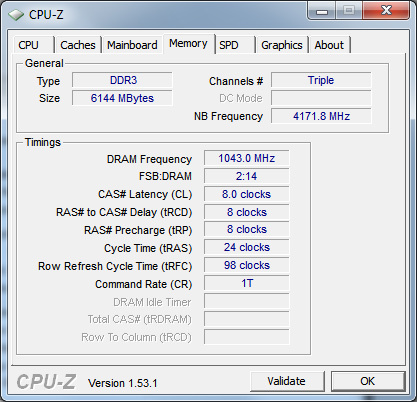 Looking under the “Extreme Memory Profile” section you’ll see the correct “@ 1000MHz” SPD info. It turns out that CPU-Z was the culprit here and strangely read a DDR3-3500 setting. In the end our KHX2000C8D3T1K3/6GX memory kit proved to be stable and reliable. Everest Ultimate Edition is a comprehensive hardware monitoring and benchmarking tool. 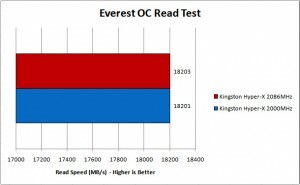 The Everest “Cache & Memory Benchmark” tool measures things such as RAM read, write, and latency speeds as well as CPU cache speeds. 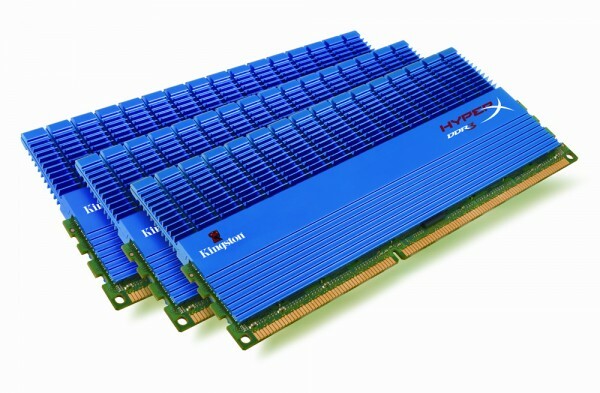 The KHX2000C8D3T1K3/6GX memory kit was tested at stock DDR3-2000 speeds with the stock timings and DDR3-1600 speeds with stock timings. We also tested this Hyper-X kit against a triple channel kit of Corsair CMX6GX3M3A1600C9. Both kits were set to the Corsair’s stock settings of DDR3-1600 and timings of 9-9-9-24 in order to get an apples-to-apples comparison. The KHX2000C8D3T1K3/6GX memory kit posted impressive numbers without breaking a sweat. Running at 2000MHz, the Hyper-X kit blew everything else away. We saw the Hyper-X kit perform about 500MB/s faster at reading as well as having slightly lower latency than the Corsair kit. SiS Sandra has been around a long time and is a popular system diagnosis and benchmarking program. 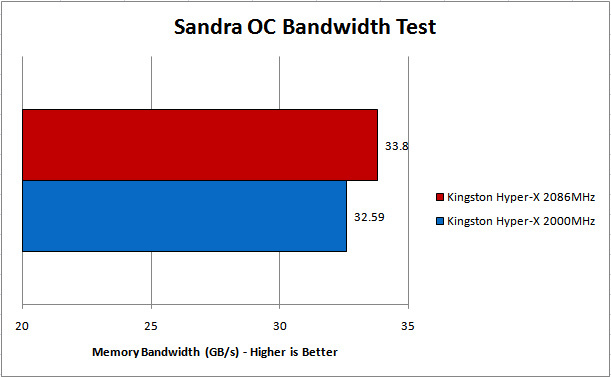 We used Sandra’s “RAM Bandwidth” and “RAM Latency” benchmarking tools for our RAM tests. Each test was run three times and the average was taken. Like our Everest test, the Hyper-X memory kit was run at DDR3-2000, DDR3-1600, and identical settings as our Corsair kit. Sandra posted some interesting results compared to Everest. 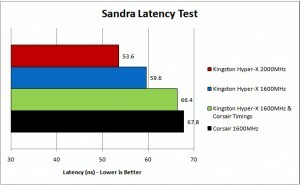 Our Hyper-X kit downclocked to the Corsair’s speed and timings proved to have less bandwidth in Sandra, even though it had faster read speeds in Everest. 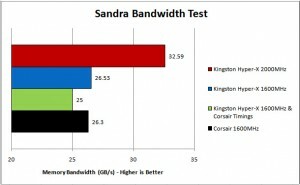 Sandra indicates that the Hyper-X slightly edged out the Corsair kit (9-9-9-24) for bandwidth with its stock timings (8-8-8-24). The kit’s stock 2000MHz clock left everything else in the dust once again. Latency-wise, the Hyper-X’s chips continued to hold the lead and were quicker compared to our Corsair kit. The KHX2000C8D3T1K3/6GX memory kit is no doubt aimed at high performance enthusiasts who want to push their hardware to its limits. We wanted to see just how much faster we could run this blue devil past its stock settings. Our goal was to see how much we could overclock, while still maintaining the stock timings and voltage. 2200MHz was the highest overclock we were able to achieve with our Hyper-X kit. While we were able to boot into windows at this speed, the RAM wasn’t completely stable and couldn’t pass 8 hours of Memtest. Our highest stable overclock put us at 2086MHz, an 86MHz bump over the stock speed. 2086MHz passed 8 hours of Memtest testing and ran everything from Photoshop to games perfectly. So what does a 86MHz bump in speed get us? An 86MHz bump in speed apparently doesn’t result in significantly better performance. 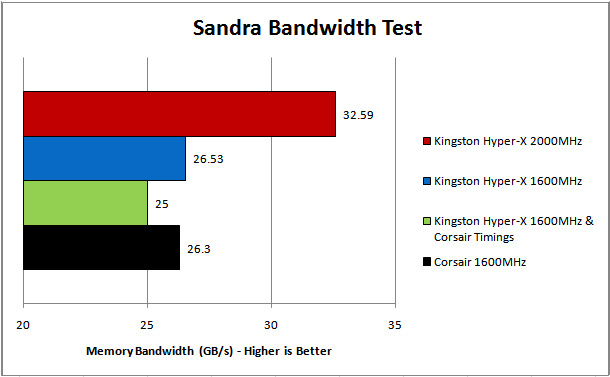 Everest’s read test showed no significant difference, however we did see slightly more bandwidth in Sandra. 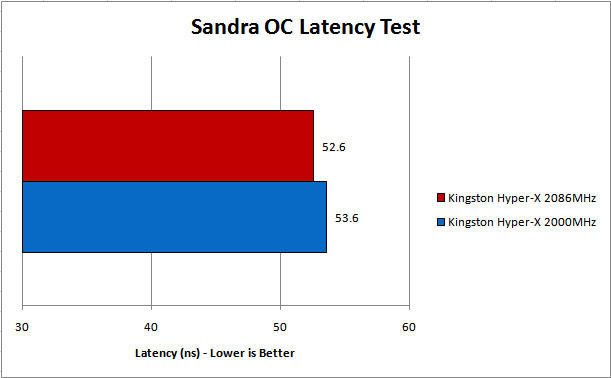 Everest and Sandra both showed a slightly lower latency over the stock speed. It appears as if at 2000MHz the memory chips are already very close to their maximum performance. The Kingston KHX2000C8D3T1K3/6GX Hyper-X leaves the competition in the dust just like the ZR1 “Blue Devil.” Although it is hard to tame in the beginning, this Hyper-X kit ran with great finesse once settled down. Our lengthy stability tests and benchmarks showed that at 2000MHz, conventional RAM and even 1600MHz RAM don’t hold a candle to this beast. The Hyper-X kit is backed by a superb Kingston lifetime warranty, ensuring that your machine stays at the top. At around $280, this Hyper-X kit isn’t cheap. 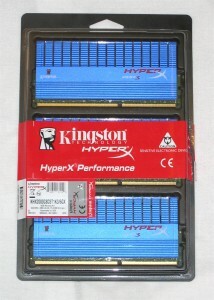 If you’re looking for the fastest triple-channel 2000MHz memory kit out there, however, then the Kingston Hyper-X 2000MHz kit is the one to get.